As a younger man I did my share of running. A few half marathons at respectable time (1:40? ), part of the cross country team in high school (bottom half…) and kept up my running to and fro once or twice a week as I approached my 40’s. In 2013 however (at the age of 42), I drastically change my training regime and increased it a lot, and quickly. My brother was going to run the Stockholm Marathon, so I took up running a little more seriously then at the same time. However, it didn’t take long until during one run I got what in Swedish is called “Gubbvad” (Old Man’s Calf) – a muscle tear in the calf. It feels like someone stabs a knife in your leg, and the only option is to limp back home... My brother told me to google “Gubbvad”, and at first I thought it was a joke… But alas, it was not! No running for a while, but the good thing is that I took up biking instead. 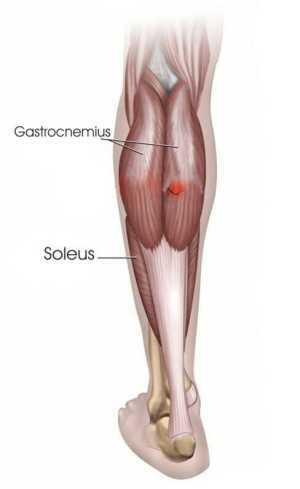 Muscle tear/rupture in the calf. After some rest from running (3-4 weeks), I started again the training. I moved back to Sweden and set my sights on Lidingöloppet, a 30km cross country run. It required a lot of training, and I put in my kilometers during the summer. Around 150km per month, so not too much. However, after the competition I started feeling my calves again, starting to hurt almost every time I tried to run. Reviewing my training logs I had to interrupt almost every run after some 5-7km. What was going on??? At work we have the opportunity to get massage therapy at an attractive price, so I went there. When he touched my calves I almost cried. They were super tense and all bundled up: he said it was some of the worst calves he had felt in a long time. The scars from the injury from earlier the year (this was about 7 months after my first injury) were still present in the muscle tissue, as well as plenty of other smaller ruptures and injuries that you get from running too much too fast at higher age. I put off running for almost five months, combined with regular massage therapy to loosen up my calves, until I started again in spring next year. Starting slowly I thought, feeling good, running faster and longer. But in July that year, the same problem came back. 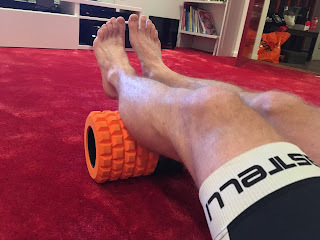 Same procedure again – hold off, massage, start running again… until a year later I got indications of a related problem (Plantar Fasciit) related to same issue (over trained calves).Three years straight with regular injury sometime during the year – extremely frustrating! Massage! This time the thighs, plenty of muscle knots there as well! In 2016 I managed to avoid calf injuries, but I think the only reason for that is that I sprained my ankle end of May when playing football with my son, so I had couldn’t run for five weeks - I think it gave my muscles a needed rest. Right now my calves are under control, but every once in a while I get that tingling feeling when running, telling me to be careful or something will come back again… Indeed, going into your 40’s, attention to your legs and avoiding injury is very important. Not only does the recuperation take much longer time as an oldie to get going again, but one seems to be much more prone to injury again if not taken care of properly. Especially muscle tears are very likely to return unless treated. So, going through quiet a few episodes and managing to get back, I have some experiences and thoughts I’d like to share. First of all, one has to realize that when you approach your 40’s, you need to be more thoughtful around your running training. Running strains your body much more than biking and swimming, so you are much more prone to injury, and also require more time to recuperate. If you are starting training, the most important aspect is to start slow and increase load slowly. Muscles build up faster than tendons, so you will quickly feel that you can run faster and longer, although your body is not yet ready for this. If you increase load too quickly, injury can soon come. So important is to start your training with slow and steady runs to build up a base – there is no need to go after speed, and build up volume slowly. After a few months of base training, one can start adding interval sessions to build up speed and strength. These sessions strain the body more, so important to not do more than one or two sessions per week – not more than 10-20% of your volume should normally be high intensity training, the rest should be very easy runs that builds endurance without straining muscles and joints. The easy runs also have the additional benefit of learning the body how to use fat for fuel (and not just depend on glycogene stored in muscles) as well as improving overall running efficiency. My magic limit has so far been around max 160-200km per month total (after good base training for 4-6 months) - with more volume than this I will normally get injured quiet quickly. I also try to be observant during my interval runs as a muscle tear if much more likely during a high intensity session that a nice slow run – the stress on muscles and legs is so much higher during these intervals. In hind sight, looking back at my running previous years, I have been to focused to run high pace sessions, always wanting to run a little longer, a little faster. Putting in sessions of 15-20km at 4:25 min/km pace felt good, but probably too tough on my legs. Now I try to take it much slower on my long runs, settling in at 4:50-5:00 pace. If I continue to remain injury free now after a year, I can slowly increase the dose, but I will do it very cautiously. Obviously, training load and set-up is very individual and has to be adjusted according to each and everyone’s own pre-conditions and situation. Secondly, good recovery is a must. This is not just resting well between running sessions, but also doing some kind of preventive work with mainly your calves. Massage is good, the deep/hard kind given by someone working with athletes, not the “oh what a nice moment this is to relax” massage. Massage loosens up the small knots you get in your muscle fibers after running (which are remains from small micro ruptures or scar tissue from previous ones) and increase blood flow to help the body to recuperate and rebuild. I try to have a massage once every two-three weeks, and I combine it with a foam roller at home every once in a while, which gives a similar effect, although not as deep into the muscles. There are many kinds of rollers, some also working your thighs (that also requires attention…). Preventive training can also be calf “push ups” in a stair case (excentriska tåhäv), ie standing on your toes at the edge and then lowering yourself down slowly, working your calves. Doing three sets of 15 push ups per leg is a good daily exercise. This builds up strength in your calf muscles, reducing the risk of ruptures and strains when running. Pain in your calves from overtraining can manifest itself in all areas of the lower legs, in the calves themselves, in your Achilles tendon, or below the feet. It often all comes stems from overtraining, and to get rid of it you need the same therapy: rest, massage and strengthening your muscles again. Stretching and Yoga are also exercises that keeps your muscles and joint flexible, reducing risk of injury if done properly. Foam roller for the calves. Good way to spend in front of the TV! Plantar Fasciit. 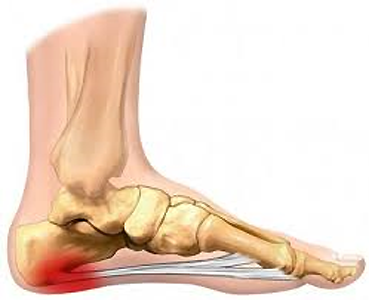 Hurts below the feet, close to the heel. IT band pain and Runner’s Knee are also symptoms from training too much too soon, all with injury risks being higher as we advance into age… Massage and stretching can help here as well, apart from rest from running. One aspect to consider as well to reduce risk of injury is a review of running technique. High cadence (180 bpm) means a shorter stride, which puts less load and impact in each step, and this reduces the injury risks. On top of this, running more on the front of your feet and not putting down the heel first in the stride changes the load on your feet and legs. That said – if you need to change/adjust your stride and running technique, this also has to be done carefully in order not to suddenly put strains on your muscles and joints in a different way than before, but give the body a chance to adjust. A change in running stride can take up to a year to adapt to. A good posture and balance in the whole body, with a strong core base in back and stomach, also helps reducing risks of your feet and legs making strange compensations, leading to injury after a while. Common factor of all the above is to really be observant to injury and make a thorough analysis of what is causing it. In my case it has been overtraining, ie building up volume and speed too fast . Improper posture and balance in the body can also be an issue. Increase load slowly, slowly. Don’t increase volume or intensity too fast. Don’t do more than 20% of your training time with high intensity, easy runs should be the vast majority of the training, even as an amateur. Do some preventive maintenance on your legs. Be aware of any pain in calves and take care of that immediately before it gets much, much worse! Make sure you have a balance in your body strength – running fast also requires good strength in your back and core to not load your legs in a strange way! I’m now injury free for almost 10 months and slowly building up my endurance and speed to higher levels than before. I set my 10k PB, running sub-40 on 10k 27 years after the one and only previous time I had done this, very much thanks to consistent and controlled running training. You can do that as well!